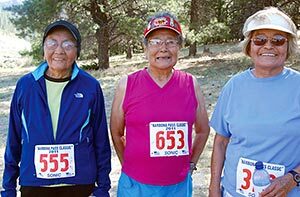 From left to right, Marie Halona, 72, Tillie Sutton, 78, and Helen Silversmith, 72, pose after the 32nd annual Narbona Pass Classic after competing in the 5K race. Age may always find a way to grab hold but for three women in their 70s, it doesn't mean you can't attempt to outrun it. "These guys are worried about their weight and figure but I'm trying to outrun old age," joked Tillie Sutton of her two friends Marie Halona and Helen Silversmith, whom she met on the local running trails. The trio - Sutton, 78 of Window Rock, Halona, 72, of Blue Canyon, Ariz., and Silversmith, 72, of Manuelito, N.M. - had just completed the 5K-race at the 32nd annual Narbona Pass Classic and were discussing the grueling course before this reporter bombarded them with questions Sunday morning in the Chuska Mountains. "The pavement was killing me," Halona said of the course. "Running on the dirt is a lot easier. I had to walk uphill but I ran downhill." If memory served them correctly, all signed up for their first Classic race in their 50s and one thing they will tell you is that the course will test you mentally and physically. "This is probably my 27th or 28th time running but it doesn't get any easier," said Sutton, who placed 340 overall with a time of 55.59. "I thought I had to crawl up the hills." Each year, runners train to compete on the 5K or 10K courses - routes that have become known as one of the toughest and most beautiful in the nation and world having earned a spot on the Runner's World magazine's top 100 courses in the U.S.
"Last weekend, I ran the Canyon de Chelly challenge," Silversmith said. "It was sandy, sandy, sandy, hard and hot! You take one step forward but 10 steps back but I finished. I told myself, 'If I can do that, I can do this.'" Sutton, Halona, Silversmith and the rest of the 5K runners raced down the pavement for about a half mile before having to plug away at Ole' Sandy hill, nearly two miles of uphill and sandy terrain. The challenge continued as runners began a slow incline up "Backbreaker Hill," dubbed by runners who said the hill seemingly never ends and causes pain to their backs. Once the uphill battle is achieved, runners then race down into a valley and then onto the main highway toward the finish line. "It's a challenge!" Sutton, Halona and Silversmith proclaimed in unison when asked why they keep coming back to run the annual race. "I'm ready to go again," said Silversmith. "Going up the hill is a killer and as you get older, it gets harder but you just have to keep at it." Keeping at it is their way of staying young and fit. "I do a lot of hard work at home too so I just can't sit down and do nothing," Halona said. "I have to keep going because I like doing it for fitness." "At my age, you aren't able to move so this keeps me going," Sutton said. "Each race is challenging but this one is hardest." They even welcome the competition. "I seem to get slower every year and I know that because she outran me this time," Sutton said with a slight elbow to Halona. "I always used to beat her." Halona was quick to respond. "She used to beat me but now I came in first," Halona said. "She was ahead of me but I passed her going up the hill." Halona doesn't pass many runners but when she does she often hears the same reaction. "Oh, there goes grandma," said Halona of something you might hear when she passes a runner. "I think they're surprised when I pass them." Of the total 345 runners, Silversmith led her two sidekicks placing 289th overall and second in the 60-plus age division with a time of 41:36. Halona followed in third place in the same division with a time of 53:42. Now that the Classic has been marked off their list of races to run, the three will now hit the 20th annual Set Your Pace series runs.